Need more cash? Energize Every Feng Shui Wealth Area in Your Home. Learn to find and activate every Feng Shui Wealth Area in your home as these money spots directly influence the prosperity and abundance in your life. Money is Energy - Money has its own flow. You can attract the flow of money to bless your home and life. Enhancing and energizing your Money/Wealth Areas work to attract new opportunities, cash flow and prosperity into your life. Financial abundance gives the freedom and opportunity to help others and live your dreams. First, you need to align Bagua map with your main front door and locate your far back left corner. For financial improvements, you need to focus your attention here as this is your most important money area. 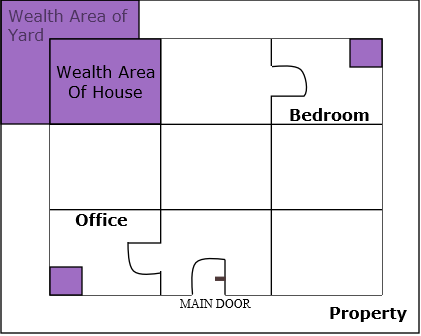 Use Feng Shui Bagua map to locate Wealth/Prosperity Areas in these 2 important rooms so you can enhance them to maximize money flow. If you don't have home office, good idea is to energize Living Room instead. Last but not least important is to find Money Area of your property if you have yard. Many times people use back of the yard for storage that turns to clutter, piling up old leaves or any other undesirable purposes. If you want to improve your cash flow and prosperity, left back corner of you yard has to be beautiful and properly enhanced to attract the flow of prosperity to you, your house and your property. Now that you learned how to properly place Feng Shui Bagua map in your home, click here to learn how to enhance and energize each Feng Shui Life Area to start improving Your Live NOW!